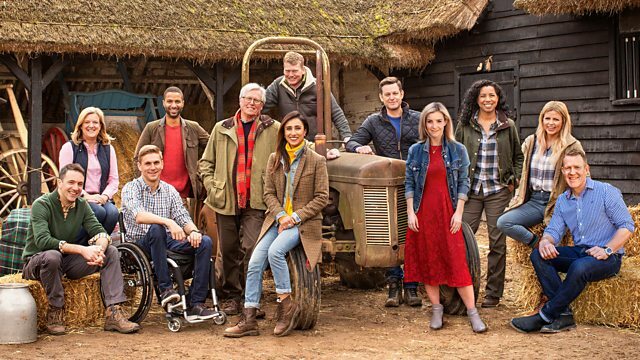 Countryfile celebrates Britain's farming heroes past and present. Adam Henson is in Bristol to reveal the winner of the first ever Countryfile Farming Hero. Countryfile celebrates Britain's farming heroes past and present. Adam Henson is in Bristol at the BBC's prestigious Food and Farming Awards to reveal the winner of this year's first ever Countryfile Farming Hero. He also tells us about his historic hero, the father of selective breeding, Robert Bakewell. Matt Baker champions Harry Ferguson, the man who invented the tractor that changed the face of farming forever. Ellie Harrison discovers more about her heroes, a group of men who set up the RSPCA, giving animals rights for the first time in history. Anita Rani finds out how a milk maid helped Gloucestershire doctor Edward Jenner pioneer a treatment that saved millions, even billions, of lives. And Tom Heap champions a man whose efforts gave farmers a voice and helped to feed the nation when it needed it the most. Adam Henson is at the BBC Food and Farming Awards 2015 to reveal the winner of the Countryfile Farming Hero competition. The award ceremony is part of the Bristol Food Connections festival and Adam gets to meet a host of food-related celebrities including Hugh Fearnley Whittingstall and Tom Kerridge. But the stars of our show are the three finalists – amazing people who are all farming heroes in different ways. But which one will win the award? At the heart of every farm is the tractor and today there are more than 200 tractor manufacturers - but few if any had such impact as Harry Ferguson. Matt Baker spends the day with tractor enthusiasts Andy and Pete Drinkwater on their farm in Gloucestershire, to find out what made Ferguson’s tractor so revolutionary. Between them these two brothers have over a hundred Little Grey Fergie tractors and tools. Matt gets a first-hand account of Harry Ferguson from his driver, and right hand man Peter Warr. Then he takes to the wheel to compete with Andy in a cultivating competition. Adam Henson and his fellow judges, the BBC’s Charlotte Smith and farmer Mike Gooding, are travelling the UK to meet the finalists in Countryfile’s Farming Heroes Award. Their first visit is to a hill farm in Perthshire where they meet seventeen year old Cameron Hendry. Cameron’s father David died suddenly on Christmas Day. That left Cameron with a tough decision – go back to school or stay home and run the family farm. Our judges hear that Cameron decided to quit classes and now he’s learning – and growing up – fast, so he can provide for his mum Marianne and younger brother Duncan. Anita Rani flies the flag for Edward Jenner, a rural doctor in Gloucestershire whose contact with the farming community saved millions, even billions, of lives. In 1796 Jenner discovered that a local milkmaid seemed to be immune to one of the world’s biggest killers, smallpox, She was protected because she had contracted the milder cowpox, from the animals she was milking. Jenner used this principle to develop a vaccine, which he then tested on local children - including his own. His pioneering work earnt him the title “father of immunology”. Vaccination went on to be used to tackle a wide range of diseases and in 1979 the WHO declared that smallpox had been completely eradicated. Adam Henson and his fellow judges are on their second visit to the finalists. They're in Worcestershire to meet 82 year old farmer Joan Bomford. Joan has always been at the heart of the local community. As well as running a beef farm and a riding school she raises money for charities and has brought up four children. The past year has been very difficult for Joan, after the death of her husband of sixty years and losing her brother in a tragic accident. Our judges see how Joan still soldiers on with her passion for farming and discovers that she has no intention of retiring just yet. Tom Heap extols the virtues of Colin Campbell, who set up the National Farmer’s Union. At the beginning of the 20th century, British farming was undervalued and unappreciated, mainly because 80% of our food came from abroad. Campbell had a farm himself and set up the NFU to give farmers a voice. His work helped to increase food production and save the nation during the First World War, when we were cut off from most of our food imports. Tom also discovers how his influence is still being felt today. The judges are in the bleak yet beautiful hills of Northumberland National Park meeting our third finalist. Shepherd Robert Bertram came to the rescue when a neighbour had a quad bike accident in the snow. Robert, who was born and raised in the National Park, used his local knowledge to search the hillside in a blizzard. Eventually he managed to find and rescue Mark Dey who was trapped under his overturned quad. The United Kingdom was the first country in the world to bring in laws to protect animals. Then, in 1824 a group of humanitarians met to create the RSPCA, a society to help enforce these laws on animal cruelty. Ellie Harrison finds out more about the men who spent their lives attempting to change public attitudes towards animal welfare. She later visits a dairy farmer in Dorset who is working with the RSPCA to rear high welfare veal, giving often unwanted bull calves a better quality life. Adam finds out about his farming hero, Robert Bakewell. Back in the 18th century, Bakewell introduced the concept of selective breeding into farming, changing the agricultural landscape forever. First Adam visits Pat Stanley, who meticulously breeds Longhorns, one of the breeds Robert Bakewell created. Then Adam learns how his techniques are still being used today – but with the help of modern science and technology. He visits a genomic bull stud in York where the very best bulls are selected for the genetic traits they can pass onto the next generation.